Redemptorist Brother Francis Alfone, the "Brother with the tattoo" and a known soft-touch for a sad story, died Wednesday, Dec. 31, at St. John Neumann Residence in Saratoga Springs, NY. He was 80 years old. A Wake Service was held in the chapel of St. John Neumann Residence, where he had spent so much time in prayer, and the Funeral Mass was offered there on Saturday, Jan. 3, with Father Edmund Faliskie as main celebrant and Father John McGowan as homilist. The seventh of 14 children born to Francis and Marie Vizone Alfone, Brother Frank was raised in Newark, NJ. Mr. Alfone was a painter by profession and restored church interiors among other buildings. Economic times were very difficult, though, during the Great Depression and Mrs. Alfone was in poor health and trying to meet all the special needs of a young daughter. Six of the other younger children, including Frank, were entrusted to the care of Sisters at St. Mary’s Orphanage. Franciscan Sister Dolores Alfone, a younger sister, recalled the holidays when the Sisters, seeing a maturity in Frank beyond his age, would trust him to take his siblings home, via two bus rides, to see their parents at Christmas. "He was nurturing us ever after," Sister Dolores said. At the age of 16, during World War II, Brother Frank decided to take his future into his own hands and ran away to join the Merchant Marines. "I was off to war and to sea in a career that was to last for ten years, taking me over the face of the earth," he wrote shortly before his profession as a Redemptorist. After a shipboard injury prevented him from going to sea again, he was honorably discharged and found a temporary home with one of his brothers, Gerardo, in Newark. A parish mission, preached by a Dominican, set him on the path of discerning his vocation and a parish curate offered spiritual direction. It was his late mother’s devotion to St. Gerard Majella, which she developed in her native Italy, that eventually led him to apply to the Redemptorists. He was accepted as a candidate Brother at Mount St. Alphonsus in Esopus, NY, in 1955 and made his first profession of vows in 1957, after spending a novitiate year at St. Clement’s Mission House in Ephrata, PA. His second novitiate year was spent in Ilchester, MD, in 1961, and he made his final profession of vows in August of that year. Brother Frank then served at Esopus as a cook, baker, chauffeur and barber. Brother Francis Robert described Brother Frank as "a masterful cook." None of his recipes started with "Open a jar …," he said, and everything was made from fresh ingredients. When the two first met, Brother Francis recalled, his confrere impressed him "as a very holy man, a very pious and spiritual man." In 1973, Brother Frank began a ten-year assignment to the Redemptorist minor seminary in North East, PA. It was at this time that abortion became an issue of political debate, following the Supreme Court ruling, Roe vs. Wade, legalizing the practice throughout the three trimesters of pregnancy. Brother Frank, with his ever-growing devotion to St. Gerard, patron of mothers and childbirth, took on a radio apostolate to spread St. Alphonsus’s message that God ‘is crazy in love" with His people and that each human life, from the beginning, is a sacred gift from God. 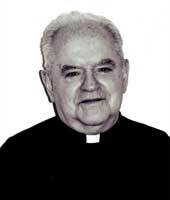 Father John Lavin was pastor of St. Cecilia Church in East Harlem when Brother Frank was assigned there in 1983. "It was quite a shock to him being in the inner-city," Father Lavin said, "but as soon as he got there, he wanted to start doing something." St. Cecilia’s is a beautiful historical landmark building, but at the time the interior walls were dingy and dirty from years of burning votive candles. "First, he washed down all the walls, then he buffed the floors, next he wanted to paint the church," Father Lavin said. Since the Archdiocese of New York holds the deed to the church, permission had to be obtained from the chancery. "They didn’t know Brother Frank or what he could do, so at first they said he could just paint a side altar," Father Lavin recalled. "But Frank had done some work with his father in painting churches and when the officials saw what he did with the side altar, they said he can do the rest of the church." With some help from Brother Francis and the loan of a scaffold from the D’Ambrosio company, which does church restoration, Brother Frank completed the transformation of the entire interior. "He told me later that during the last few weeks he was having inner ear problems, which made him dizzy, but he never said anything because he was determined to finish the work." When Father Francis Skelly returned as pastor of St. Cecilia’s, he found Brother Frank serving as sacristan and working with parish social services. "He was a lot of fun and a great person for telling stories from his time in the Merchant Marines," he said. "His work in parish services was outstanding. He looked tough, but he was gentle with people and a soft touch. People in trouble would come asking for the Brother with the tattoo. He was godfather for I don’t know how many children in the parish and just about everyone else thought of him as a grandfather." One of Brother Frank’s stories that Father Skelly especially appreciated was of the time his parents arranged to have a statue of St. Gerard shipped from Italy for St. Lucy Church, their home parish in Newark. When they told the steward that had come to pick up Gerardo Majella, the poor man checked and checked and could not find him on the passenger manifest. The Alfones had not made it clear that they were there for a statue in a crate and not a man who would walk off the ship. Parishioners protested vehemently when they learned in 2001 that "their Brother" was going to St. John Neumann Residence in Saratoga Springs, Father Skelly said. What they didn’t know, because of Brother Frank’s kindness and good humor, was that he was suffering from heart problems and difficulties with his knees and many years of combat­ing bouts of clinical depression. At Saratoga Springs, Brother Frank became a great favorite of the nurses, according to Benedictine Sister Serafina Samouska, who directs the nursing staff. "He was a man of peace, of good sense, or humor, a man of prayer," she said. A whole wall of his room was decorated with pictures of babies and their mothers whom he had helped with prayers, advice, his stipend, or whatever he had to share with them. Sister Serafina also noted that Brother Frank had served as guardian for a sister who needed institutional care after the death of their mother. It was only in his last weeks that he arranged to relinquish this responsibility to his other surviving sister, Sister Dolores. "Frankie was a wonderful big brother," Sister Dolores said. "I remember at his 50th jubilee he had a lot of people coming up from St. Cecilia’s to celebrate with him." She recalled blessed times when she and her brother were able to get some vacation days at the same time, he at San Alfonso Retreat House in West End, NJ, and she at her community’s summer house a short distance away. "We would get together and sit on a bench and talk about how good God is," she said. Sister Dolores was expecting to see Brother Frank on New Year’s Eve, but the secretary at St. John Neumann’s, who had offered to pick her up and drive her to upstate New York, called and insisted on getting her a day earlier, due to a forecasted snowstorm. "I was able to visit him Tuesday night and pray the Divine Mercy Chaplet and the Rosary with him and Father Gerard (Szmkowiak) and Father Jim (Dowds). A staff menber waked her in the early hours of Wednesday morning and she was able to be at her brother’s side as he died. "I was so fortunate to be there when he died," she said. "I reminded him that the Blessed Mother was coming for him."